I attended the Deadly Ink conference this past weekend and the authors of these books were all there. The Donna Andrews book I picked up ahead of time after hearing that she would be the Toastmaster of the event and realizing I had never read any of her books. I purchased other books at the conference, which was excellent and very well ran. I would highly recommend it to anyone who wants to attend writing classes, listen to authors on panel discussions and just in general meet with authors in a more intimate setting. 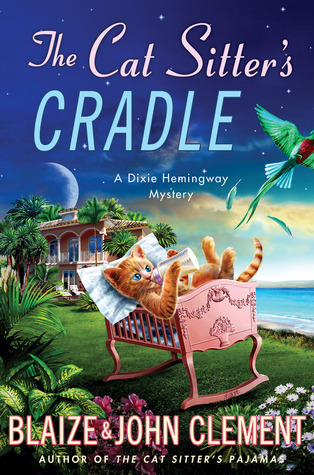 The Cat Sitter’s Cradle is book 8 in the Dixie Hemingway series, a series began by Blaize Clement and continued by her son, John after her death. I had read a book or two in the series a while ago, unfortunately I am not very good at keeping track of my series and was surprised to see how many books I had missed. This happens to me all the time with lots of series. Even though I read this one out of order, it did not impact my enjoyment of it. The book opens with Dixie stumbling across both a woman giving birth and a “dead” expensive exotic bird while walking her dog. The book takes off from there and continues at a good pace. On one of Dixie’s pet sitting jobs, a dead body appears and she finds herself right in the middle of the investigation, knowing both the victim and the suspects. The mystery plot was well done and I was surprised at who the killer was revealed to be. The characters are interesting and very natural feeling. Dixie’s back story is tragic and probably a little darker than the average cozy, but makes her a more complex character. Dixie’s brother and his partner are well done, in that they fit seamlessly into the story. Lately, I have noticed that there seems to be a trend to have a gay character, just for the sake of having a gay character, not because they are a purposeful part of the story, that type of insertion feels to me more like a marketing ploy and turns me off. Very good pacing throughout the story and the romantic subplot was charming. The writing gave a well defined sense of place (or at least I think so having not spent much time in Florida). Lovely, quick reading cozy mystery. I bought a second one at the conference, The Cat Sitter’s Pajamas which I will read soon. Murder with Peacocks was written by Donna Andrews, the Toastmaster of the convention. This series is set in Yorktown, Virginia and I spent some time growing up in Norfolk, so I am somewhat familiar with Virginia. Meg Langslow has returned home for the summer to be the unpaid, unofficial wedding planner/wrangler/point person for not one, but 3 family members. Lots of crazy characters and antics are involved here along with the murder of a particularly unpleasant guest. There is also a romantic interest, sort of anyway. Let’s just say that there are obstacles in the way of the romance and leave it at that. This is the first in the series and so I assume that that is why so little of the book is actually concerned with the mystery, rather it involves the antics of a wide ranging cast of characters. I feel as though this book really was introducing the supporting characters, the setting and the sleuth. Setting up for a very popular and long running series of cozy mysteries. 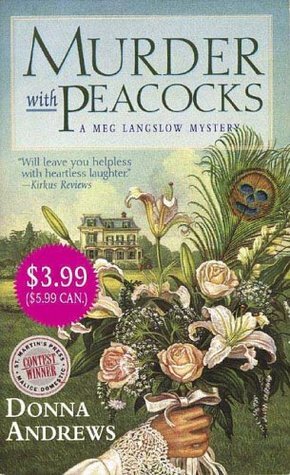 Definitely on the side of the humorous cozies, this series seems more for comedy than mystery. 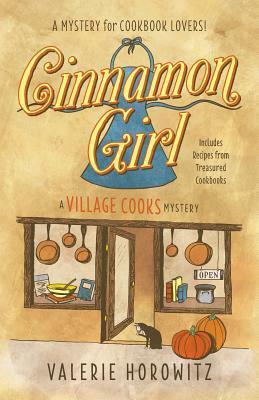 Cinnamon Girl: A Village Cooks Mystery by Valerie Horowitz is a culinary mystery with some interesting political connections. The sleuth Bonnie Emerson, is a daughter of a former POTUS. Now married, she has a son and a small cookbook and cooking supply store in a affluent New Jersey community. A murder occurs and through several events it becomes evident that the murderer thinks that Bonnie knows who he is. The Secret Service is called in and the investigation continues through a large cast of characters, interesting cookbook references, and another death. I live in New Jersey and so the setting is very familiar to me and seemed accurate. There is a large cast of characters and the author provides a list in the front of the book to keep them straight. This is the author’s first in a series of Village Cooks Mysteries. This entry was posted in Book Reviews and tagged book review, conference, deadly ink, mystery.